Pars Pack Review 2019: Is Pars Pack a Good Hosting? 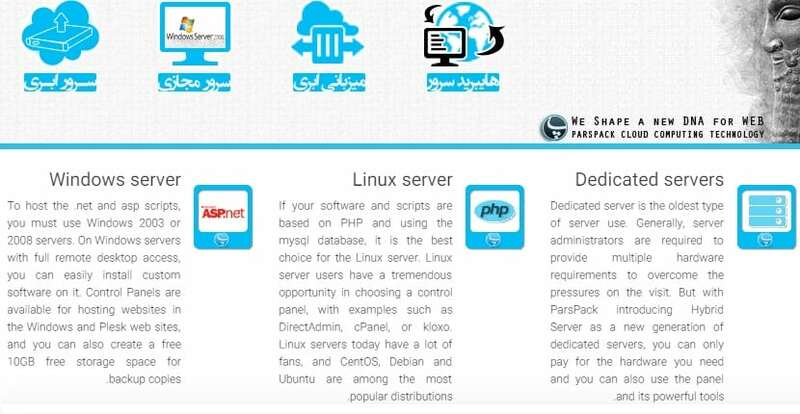 Pars Pack was one of the first Iranian hosting companies to offer cloud hosting. They have hosted more than 8000 domains, and they’re known for their affordable website hosting solutions, SSL, reliable VPS, and dedicated servers. Pars Pack has been a pioneer in Iran’s web hosting industry since it was founded in 2010. They provide their customers with both affordable hosting solutions and excellent support. Their main servers are located in Iran, with others colocated in the Netherlands and Germany. Unless translated in your browser, their website is in Persian. Pars Pack offers its customers multiple control panels including cPanel, Plesk, DirectAdmin, and Website Panel. They are all easy to use and easy to install on your Linux or Windows VPS (as appropriate). Setting up a website is a breeze. Thanks to their custom auto-installer, you can install a number of open source scripts for CMSes such as WordPress, Joomla, and Drupal without any special knowledge or coding experience. I also like how Pars Pack makes good use of both SSD drives and HDD drives for their shared hosting packages. Databases are stored in an SSD drive, with regular files in a regular HDD, so you get the best of both worlds. If you prefer to have everything stored in SSD drives, you can order their hybrid servers. My main concern with Pars Pack is that their website is in Persian and does not have support for other regions. Not a problem if you speak Persian, of course. When it comes to pricing, Pars Pack gives you a number of low-cost plans, so you can easily find the right package at the right price. Their low prices do not impact the quality of the services, and scaling up shouldn’t be a problem. Pars Pack prices compare favorably with some of the top hosting services in the industry, and they’ll help you migrate your website. You can sign up for monthly, quarterly, semi-annual or annual plans, and pay conveniently via wire transfer or any of the major credit cards. They don’t charge set up fees. Support is only in Persian, but (from what I found out) their support team is friendly and responsive. I believe they can help you resolve a range of hosting issues, and they typically reply within an hour. You can reach the support team via live chat, email, and telephone, Facebook and Twitter. Alternatively, you can trawl their blog to find solutions to some of your problems. Pars Pack is a pioneer in the Iranian hosting space. If you’re looking for a range of hosting options at affordable prices, you should give them a try. Wondering how Pars Pack stacks up against other Web Hosting companies? Enter any other Web Hosting company and we will give you a side-by-side comparison.